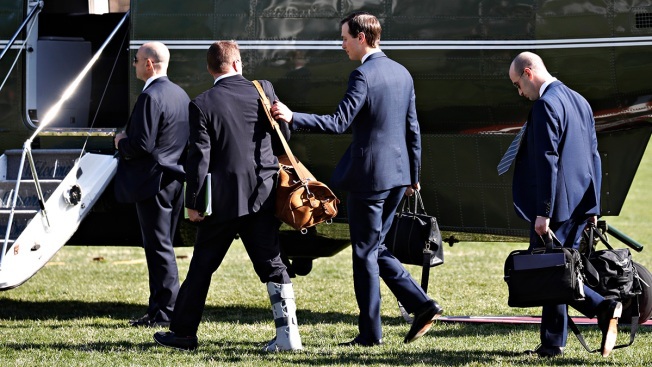 In this March 28, 2019, file photo, White House acting Chief of Staff Mick Mulvaney, left, walks with White House senior adviser Jared Kushner, and White House senior adviser Stephen Miller, to board the Marine One helicopter on the South Lawn of the White House in Washington, to travel with President Donald Trump en route to Michigan. Amid the chaos, Stephen Miller is in charge now, NBC News reports. The iconoclastic hard-line young conservative policy aide to President Donald Trump, hated by the left, and celebrated by the extreme right, is the obvious winner in the power struggle that led to Kirstjen Nielsen's ousting Sunday night as Homeland Security secretary. He's unofficially taking the reins of border security amid a purge at the department that has also seen Secret Service Director Randolph "Tex" Alles removed from his job and Trump's pick to head the Immigration and Customs Enforcement agency, Ron Vitiello, yanked. Miller has survived them all. He's the only permanent fixture on immigration policy. That means he's running the show — and the president's success or failure is on him. President Donald Trump's re-election strategy depends on locating Americans who agree with him but don't usually vote and driving them out to the polls in droves. That, he has clearly concluded, means taking the hardest possible line on immigration and presenting it primarily as a security issue.